(30-01-2015 09:18 AM)Don Wrote: Hi and welcome bearsarecool! Most likely the solder connection between the USB socket and the circuit board is broken. If you can get the thing apart it may be possible either to replace the connector or resolder the existing one. This will be a tricky bit of soldering though. Sorry if this didn't come across clearly in my original reply, but yes, I reached the same conclusion. Was just a bit scared about taking anything beyond the plastic that hides the circuitry apart and was hoping for either direct advice on deconstruction and what exactly needs to be soldered (which I have not been able to find), or a link to something describing micro-USB socket-to-circuit board soldering in general. I have taken apart and fixed a couple smartphones and replaced a PS3 drive, but have very little actual soldering experience. I would have free access to a really old soldering iron if needed. What aspect do you think would be "tricky", and what is the standard material used in these circuit board contexts? Again, just a link or even a shout to use the search function would be fine! Sample applies to replacing the connector, if this should this be the better option. Thanks. I'm now going to take as much of it apart as I think I'll get back together again to see if I can visually locate the problem. EDIT: Having looked at it again, what worries me is the fact that it looks like I'll have to also remove the (it must be said) very fine job of glueing that was done to get to the USB. I'm not sure how to go about doing this. I don't have a Hana, but there just has to be a video on YouTube showing the disassembly. The tricky bit will be the very small space to solder and there are four connections to resolder. I believe copious use is made of hot glue to hold everything together, you will have to remove this. If you're not confident of the soldering, you'll likely find someone around you who will for not much money. From a quick look around there doesn't seem to be a lot of detailed disassembly information out there. (31-01-2015 01:35 PM)Don Wrote: 1) I don't have a Hana, but there just has to be a video on YouTube showing the disassembly. 2) I believe copious use is made of hot glue to hold everything together, you will have to remove this. 3) If you're not confident of the soldering, you'll likely find someone around you who will for not much money. 1 again) From a quick look around there doesn't seem to be a lot of detailed disassembly information out there. Tyvm for reply, took the liberty of numbering the quote, I need to improve my forum quoting skills. 1) Exactly, thats what I thought, guess I'll look again now, have spent a good time looking already though. Hence my original reference to the potentially far-reaching implications of the OPs review of the best clone there seems to be, which is also dead cheap. 3.) I would like to get proficient at soldering and may use this as an opportunity to do so, especially since I'll be getting the MPV 3.0 when it comes out anyway. Worst case scenario I'll get an 18650 charger. Bearsarecool - I'd not normally use USB charging at all. I much prefer a decent charger I can keep an eye on. The USB charging circuitry may, or may not be good. I'd suspect the latter, and I'd far rather use a separate charger every time. That said, I own a lot of chargers. I could charge 36 18650s simultaneously if I had to. though several of the chargers involved I'd prefer not to use. I could charge 28 at a time with chargers I'm happy to use. (31-01-2015 06:49 PM)Don Wrote: Bearsarecool - I'd not normally use USB charging at all. I much prefer a decent charger I can keep an eye on. The USB charging circuitry may, or may not be good. I'd suspect the latter, and I'd far rather use a separate charger every time. That said, I own a lot of chargers. I could charge 36 18650s simultaneously if I had to. though several of the chargers involved I'd prefer not to use. I could charge 28 at a time with chargers I'm happy to use. TY for your thoughts, 36 at once lolol. I guess this would be a good investment in the long run anyway, though I will never get into mech mods. So considering that I'm on a tight budget and will at the very most be wanting to charge 2 18650s at a time (unattended, if this is even possible safely), whats a realistic price range? EDIT2: Going with the NiteCore NC-i2 (v.2014), sounds like nothing can go wrong with this one. Don (or anyone), why no USB charging for you? Safety-related? Whats the difference between keeping an eye on a "proper" charger and a usb-charging boxmod? EDIT: I've noticed I'm derailing this thread, will find the resources on battery-related topics etc myself after Don or someone else knowledgeable hopefully replies to just the last 2 questions in this post. USB charging is just not a good idea, the wiring inside the mod to charge it could (likely) be of inferior quality and cause all kinds of problems, like overcharging the battery, shorting the mod, etc. It's not something I would fool with anyway, I use a XTAR XP4 that I'm very happy with, though that's a 4-cell charger so it's bigger than what you'd need. Don may have other reasons, those are just my reasons why I would be afraid to use the USB charger, but he knows a lot more about it than I do. As for your second question, I honestly can't say since I wouldn't go near an 18650 mod with a USB charger in the first place. And the reason I specified an 18650 mod is because I do use an iStick from time to time, but that's a little different since the battery is actually a part of the mod itself and can't be removed, so I expect it to be good quality and perform as designed. K, thanks Michael, I get you. Just to play devil's advocate here, what would your opinion be of an 18650 mod by, say, Innokin? (I know that's not gonna happen, but I'm sure you get my point). 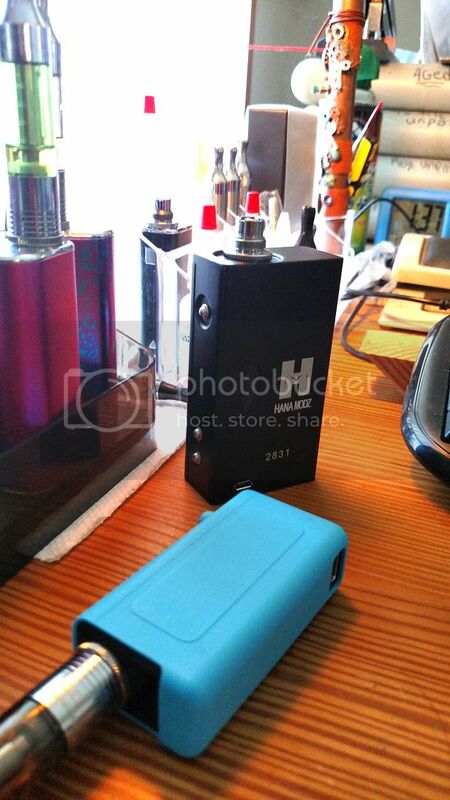 From what I gather, the Istick is pretty damn cheap for an "authentic" boxmod, hence the popularity I guess. Why do you trust this (presumably) cheap integrated battery + charging circuit more than, say a high quality 18650 cell+an *AUTHENTIC* US-built Hana Modz? Mostly because I have one and it works well For me, there's a big difference between "mods," by which I mean anything that takes an 18650 or 26650 cell or multiple cells, and a "device" like the iStick. The iStick is something like a cell phone, it's made to be charged over and over again and the built-in battery is designed to work well with the device. A mod with a charger, on the other hand, is just a mod that happens to have a charger strapped onto it. There's a big difference between the kinds of batteries used in devices like the iStick and an 18650. Basically I trust it because it's made to be that way, whereas 18650s are not specifically designed to be charged inside an ecig. I doubt if there's much difference between using the mod or using a cheap charger, but I don't want to take that chance, and I use a charger that's much better than the cheap ones.